Two latte drinkers in California filed a lawsuit Wednesday accusing Starbucks of deliberately underfilling its latte cups in order to save money. Starbucks is being sued for allegedly underfilling its latte cups. The lawsuit, filed in federal court in Northern California, seeks class action status on behalf of buyers of Starbucks caffe lattes and flavored lattes. At retail locations, Starbucks states that its lattes contain 12 fluid ounces for its tall size, 16 ounces for grande, and 20 ounces for venti. 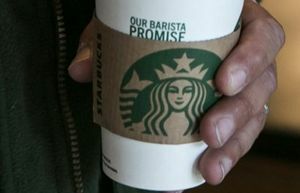 The lawsuit claims Starbucks’ lattes are made from a standardized recipe, which the coffee company instituted in 2009 to save on the cost of milk, one of the more expensive ingredients. “The standardized recipe requires Starbucks baristas to fill a pitcher with steamed milk up to an etched ‘fill to’ line that corresponds to the size of the customer’s order, pour shots of espresso into a separate serving cup, pour the steamed milk from the pitcher into the serving cup, then top with ¼ inch of milk foam, leaving ¼ inch of free space in the cup,” according to the suit. That standardized recipe results in “beverages that are plainly underfilled” and “moreover, the serving cups used by Starbucks for its lattes are simply too small to accommodate the fluid ounces listed on Starbucks’ menu,” the lawsuit states. The legal action was filed on behalf of Siera Strumlauf, a San Francisco resident who visited her local Starbucks one or two times a week, where she would spend $3.95 for a grande plain or vanilla-flavored latte, and Benjamin Robles of Carlsbad, who in January 2015 ordered a grande-sized latte for $3.95. A Starbucks spokesperson said in a statement: “We are aware of the plaintiffs’ claims, which we fully believe to be without merit.